It was my first foray into Brooklyn, and although the purpose was to attend a friend’s birthday party, I just couldn’t resist trying one of their restaurants while I was there! Looking up restaurants that serve low carb foods is very hit and miss. It’s practically impossible to tell if something will come with a sweet sauce or include some forbidden ingredient. But one has to eat, and so we decided to try Traif. 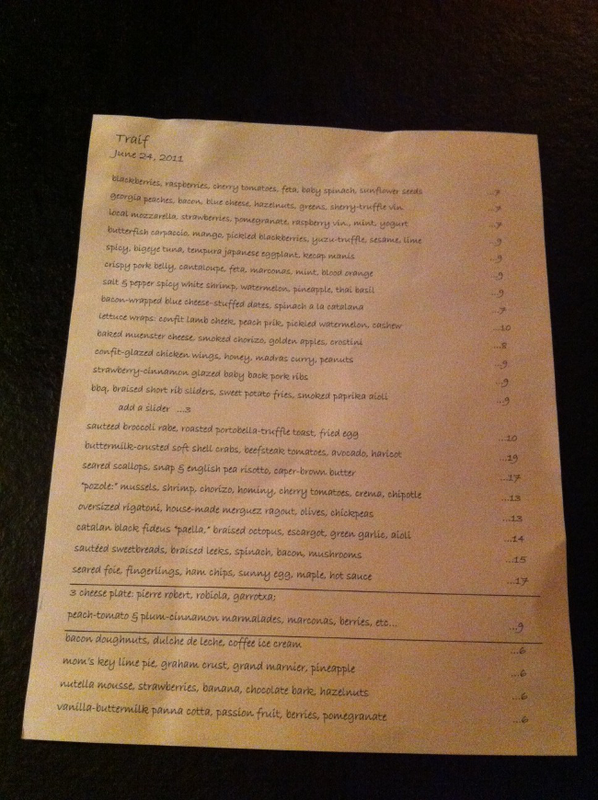 Traif is a restaurant located in Williamsburg, Brooklyn (229 S. 4th St.). It’s fairly small, but they utilize the space well with the kitchen right behind the bar. 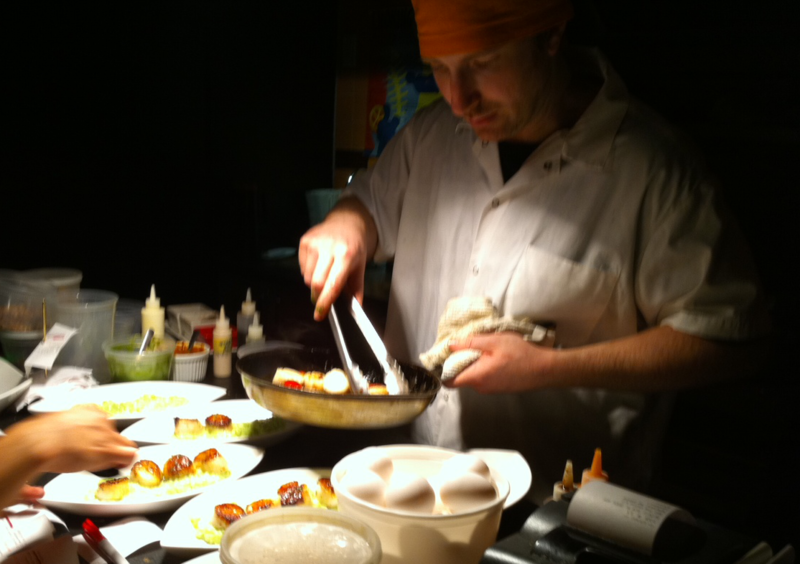 I was seated at the bar looking at the cooking station and spent the entire meal ogling all the delicious treats that I couldn’t eat (most notably bacon donuts!). The menu was tapas style, so we went for 5 plates that seemed reasonably low carb between 2 of us. 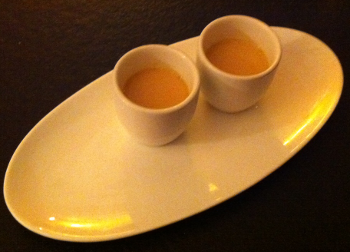 To kick start our appetite for all things pork, we were served with these bacon broth drinks. Absolutely delicious and not greasy at all! This came standard with every meal. For our next dish, we broke with the pork tradition and went for the butterfish carpaccio with mango, pickled blackberries, yuzu-truffle, sesame, and lime. The sauce was rather vinegary, which contrasted well with the sweet mangos. However, the sauce overpowered the mild fish. Also, it didn’t seem to be all that popular of a dish as only one other person ordered it during the whole time I was there spying on the chef’s creations. Next up, crispy pork belly with cantaloupe, feta, marconas (a type of almond), mint, and blood orange. Delicious – the pork belly was deep fried with a crispy, crackly outside. The sauce on the dish was salty, which combined well with the refreshing cantaloupes. On to the ribs. 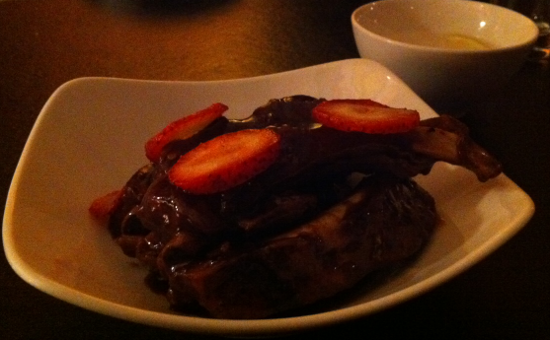 I was rather apprehensive about ordering baby back pork ribs with a strawberry-cinnamon glaze as the glaze just sounded way too sugary and possibly sickly sweet. After being reassured by the waiter that the dish did not come smothered with sweet sauce, I reluctantly ordered it. It was indeed not a sickly sweet or thick sauce. The meat came pretty easily off the bone, and the sauce added a light compliment to the delicious pork flavor! What made it even better was the fact that we got 5 meaty ribs for $9. My favorite dish was the bacon-wrapped blue cheese-stuffed dates sat atop a bed of sauteed spinach. The sauce that they drizzle on top is unfortunately a bit sweet, but I tried to deal with the situation by wiping the sauce off on the spinach. 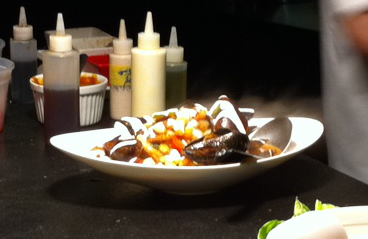 It was an amazing dish – the burst of flavors was fantastic. I’m not always a blue cheese fan, but the sweetness of the dates, along with that blue cheese taste and the saltiness of the bacon made just the right combination! The photo sadly does not do it justice – in fact they give you 4 pieces, but it looked so delicious that we forgot to take a photo before we tucked in! The last dish was sauteed sweetbreads with a braised leeks, spinach, bacon, and mushrooms sauce. Sweetbreads sound quite appetizing and full of carbs, but it is actually certain glands (like the thymus or pancreas) of a calf or lamb. Still sound appetizing? It definitely isn’t my top choice of foods, although it is very popular in many parts of the world. The sweetbread is fried with a light batter (more a dusting of flour), which unfortunately ruins the low carb aspect of the dish. However, it is quite tasty, especially when eaten with the mushroom sauce. Unlike the other dishes that we ordered, this one was a lot less flavorful. I don’t mean that the dish itself was bland, though – just that all the previous dishes involved a much stronger injection of flavor. All in all, a delicious meal with probably a few too many carbs unfortunately! But it was light on the budget – around $75 including tax and tip! (I know it doesn’t sound like it, but that’s way cheaper than a meal in Manhattan!) 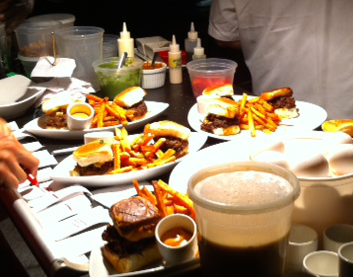 Below are photos of the short rib sliders and the pozole (a type of stew).